Maud Ashdown. Image courtesy Sydney Mail. Maud Ashdown was born in Mackay in 1886, the fifth of nine children of Edward Parker and Florence Eleanor Ashdown. Maud’s father, Edward, was the manager of the Mackay branch of the Commercial Banking Company of Sydney. He was later transferred to Newtown, then Inverell and later Bega. In April 1899 he was appointed manager of the Orange branch, a position that he held until his death in March 1909. In December 1914 Maud qualified as a member of the Australasian Trained Nurses’ Association. 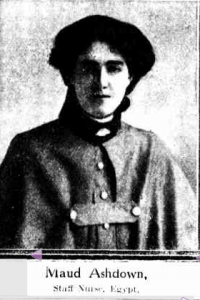 She volunteered her services in October 1915, the third member of her family to do so. Two of her brothers had enlisted earlier in 1915, and two more would enlist later the same year. Nurse Ashdown embarked for overseas service from Sydney in October 1915 aboard HMAT Orsova, a staff nurse with the No 2 Australian General Hospital Special Reinforcements. In March 1916 she was assigned to No 1 General Hospital at Heliopolis in Egypt. Five months later she was hospitalised with a peritonsillar abscess and sent to Bulkeley Rest Home in England to recuperate. Maud resigned her appointment and was discharged on 7 March 1917, following her marriage to James Septimus Mann, a merchant seaman. The couple returned to Australia and settled at Sydney’s northern beaches. James passed away in Manly in 1946, aged 60; and Maud in Dee Why in June 1975, at the age of 88. Maud Ashdown is commemorated on the Holy Trinity Church Orange Honour Roll, where her father was a church warden, and also on St Clement’s Church Mosman World War 1 Roll of Honour and on the south face of the Mosman War Memorial. Four of Maud’s brothers also served in WWI: Cecil Parker and Edmond Arthur were killed in action in France in July 1916 and April 1917 respectively, Ernest Ewen returned to Australia in March 1916 and Clive in August 1918. This entry was posted on March 17th, 2016.